On November 1, Ecoss gathered at Root Public House in Flagstaff to discuss the recent report from the Intergovernmental Panel on Climate Change (IPCC) on warming and what it means for the research center’s work. The report, built on over 6000 scientific references, was a warning bell for scientists and policymakers when it was issued in October. Impacts from warming are highly non-linear, the authors found, and tipping points nearer than previously assumed. The report demonstrated that the previously accepted threshold of 2˚ will not prevent irreversible damage to societies and natural systems and indicated that the global community has 12 years in which to reduce emissions to keep warming under 1.5˚C. 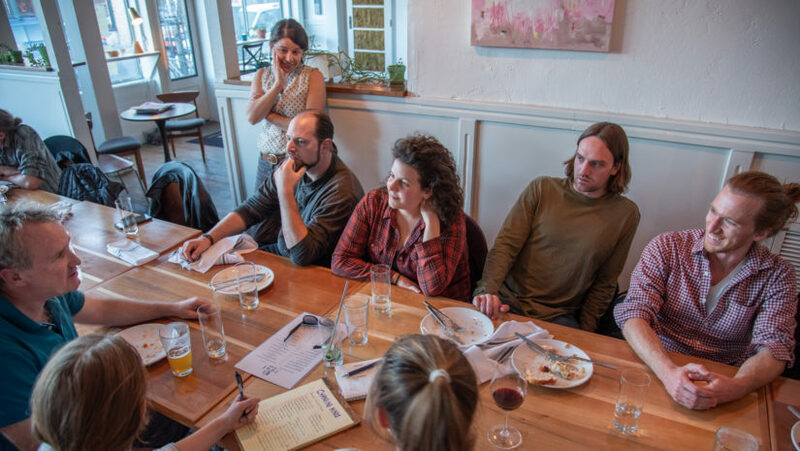 Nearly 30 faculty, students, staff, and postdocs joined in this first conversation, shared ideas about what climate leadership looked like, and brainstormed ways that Ecoss might respond to the report. The Center is now seeking ideas from all members as it looks toward next steps.